Love 2 Live Care approached us looking for a better way to manage their website. At the time, they had a static website and a blog that was not integrated and hardly kept up-to-date. Love 2 Live Care wanted the ability to easily manage their website pages, integrate the website with their blog, and gain positioning within the major search engines, particularly Google. Further, no one at Love 2 Live Care had previously used WordPress and they needed training and guidance once the site went live. 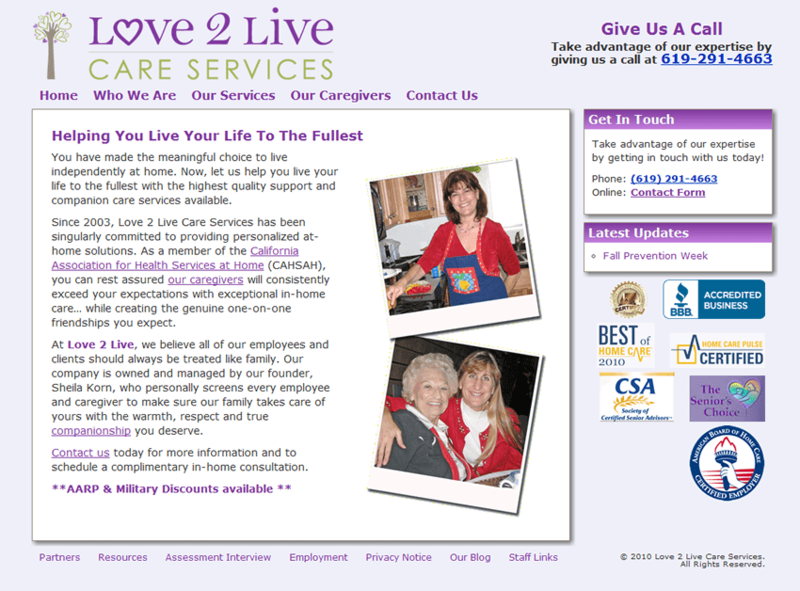 Prior to connecting with us, Love 2 Live Care was already working with a separate company to assist them with managing their Google and SEO campaign. Within 2 weeks, we had a custom WordPress theme built based on the old site’s layout and functionality, including a few custom post types to handle a few unique requirements. Within another week, Love 2 Live Care was trained and operational on their new website. Now that Love 2 Live Care is up and running on their new website, they continue to benefit from one of our support packages allowing them to focus on their business while their website is kept updated and backed-up, worry free.